I begin this roundup with a confession: I lack the technical skills to make this photo of 15th Subcircuit Democratic Candidate Anna Helen Demacopoulous the same size as the only photo that I have for her Republican challenger, Peter Fera. That's Mr. Fera on the upper right. Peter Fera is "Qualified" for the office of Circuit Court Judge. Mr. Fera was admitted to practice law in Illinois in 1968. Mr. Fera is well regarded for his knowledge of the law and extensive practice experience. Mr. Fera possesses all the requisite qualifications to serve as a Circuit Court Judge. Anna Helen Demacopoulos is “Qualified” for the office of Circuit Court Judge. Ms. Demacopoulos was admitted to practice law in Illinois in 1985 and currently serves as a supervisor in the special prosecutions unit of the Cook County State’s Attorney’s office. Ms. Demacopoulos is highly regarded for her integrity, legal knowledge and ability, and outstanding temperament. Anna Helen Demacopoulos was admitted to practice in Illinois in 1985. Ms. Demacopoulos has spent her entire career with the Cook County State’s Attorney’s Office and is currently the Supervisor, Special Grand Jury, in the Narcotics Bureau at 26th and California. Prior to that she was a Deputy Supervisor in Felony Review (3 years), a Deputy Supervisor in the First Municipal Division (5 years), and an Assistant State’s Attorney (8 years). From 1987 to the present, she has been an adjunct professor at the John Marshall Law School teaching all levels of trial advocacy. Since 1997, she has been the Grant Reviewer and Program Consultant on Domestic Violence, Stalking, Hate Crimes and Community Prosecution for the Department of Justice’s Bureau of Justice Assistance, Violence Against Women’s Office. The investigation of this candidate confirmed her talent as a lawyer, her integrity and her work ethic. Ms. Demacopoulos identified two cases in which her professional conduct has been commented on by the Appellate Court. A Chicago Tribune investigation also uncovered a 1989 Batson violation that the district judge found to be the product of the candidate’s inexperience. Upon review, we regard these matters as insufficiently serious or current to disqualify the candidate. The Council finds Ms. Demacopoulos Well Qualified to serve in the Circuit Court. These comments were apparently generated by the Council in 2002 when Demacopoulos applied to serve as an Associate Judge. Peter A. Fera has been a lawyer since 1968. Mr. Fera is considered to be a highly experienced attorney in will and estates, trusts, banking regulations and compliance, mortgage law, and real estate work. He is considered to have good legal ability in transactional work. While his litigation work is limited, he has done some insurance defense litigation and eviction work during his career. Mr. Fera is a highly respected transactional lawyer who has demonstrated solid ability. The Council is concerned, however, that judges need to have substantial litigation experience before going on the bench. On balance, the Council finds him Not Qualified for the Circuit Court. The Chicago Tribune has endorsed Demacopoulous in this race. Ms. Demacopoulos' campaign website is www.annaforjudge.com. If Mr. Fera has a campaign website, I have been unable to locate it (remember: I do not claim superior technological skills). I will of course update this post if someone points me to Mr. Fera's site. In the 12th Subcircuit race for the Devlin vacancy Democrat Pamela Loza (at left) is battling Republican Laura J. Morask (right). The Chicago Tribune recently endorsed Loza; the Fraternal Order of Police endorsed Morask. Laura J. Morask is "Qualified" for the office of Circuit Court Judge. Ms. Morask was admitted to practice law in Illinois in 1987 and is a highly skilled and experienced supervisor in the Cook County State's Attorney's office. Ms. Morask possesses all the requisite qualifications to serve as a Circuit Court Judge. Pamela E. Loza is “Qualified’ for the office of Circuit Court Judge. Ms. Loza was admitted to practice law in Illinois in 1978. Ms. Loza is a sole practitioner who handles her family practice well and efficiently. She has both civil and criminal trial experience. She is bilingual and knowledgeable about diverse communities and practice issues. She is smart and organized and capable of handling any cases presented to her. Pamela E. Loza has been a lawyer since 1977. She is currently a sole practitioner specializing in family and criminal defense law. From 1984 to 2003, she handled similar cases as a lawyer in the firm of Cameron, Loza & Associates. From 1978 to 1981, she did appellate work as a Cook County Assistant State’s Attorney. Lawyers report that she has good legal ability and that she is a zealous, but fair advocate for her clients. She has substantial litigation experience. The Council finds her Qualified for the Circuit Court. The Chicago Council of Lawyers initially found Morask "not recommended" because she failed to participate in the Alliance evaluation process. All of the other Alliance groups found likewise. In a January 11 comment to this January 9 post, Ms. Morask explained that Alliance "required their application back in the last week of August after only a short time of being available." She was unable to comply with that "strictly enforced deadline," she wrote, because she "was out of town on our only annual family trip with my husband and two teenage boys before one goes off to college." There is no question that moving the primary from mid-March to early February created enormous time pressures for candidates and evaluators alike. Laura Morask is running to fill a judicial vacancy in the 12th Subcircuit. For the February 2008 primary, she refused to cooperate with any of the ten bar associations comprising the Alliance of Bar Associations for Judicial Screening. As a result, she was found either Not Recommended or Not Qualified by all of these bar groups. The Chicago Council of Lawyers followed its policy of finding Not Recommended any judicial candidate who refuses to submit materials to the Council for evaluation. However, upon further analysis, it is clear why Ms. Morask refused to be evaluated by the Council – a bar group which has been evaluating judges since 1970. For the past nine years, she has been cited numerous times by both the Illinois Appellate Court and the Illinois Supreme Court for prosecutorial misconduct. As a career Cook County prosecutor, Ms. Morask has the job of upholding justice – convicting guilty defendants while upholding the ethical framework of the criminal justice system. Based on court opinions she has done the former but has ignored the latter. In 1999, the Illinois Appellate Court found that Ms. Morask "acted contrary to the spirit of discovery rules and that her conduct "troubled" the court." In 2000, the Illinois Appellate Court reversed a murder conviction and remanded for a new trial due to Ms. Morask's "pervasive misconduct" in rebuttal argument. The Illinois Supreme Court rebuked her performance in a 2001 decision. In 2002, the Illinois Appellate Court found that she engaged in "intentional and systematic misconduct" that "called into question the State's commitment to fair and just enforcement of the law." In 2003, the Illinois Appellate Court concluded that Ms. Morask misstated the law, but that her misconduct did not affect the outcome of the case. In 2004 an Illinois Appellate justice described Ms. Morask’s courtroom statements as "uncivil and overly sarcastic, if not downright boorish" and had "no place in a trial." In 2006, the Illinois Appellate Court in an unpublished decision found that Ms. Morask's closing argument mischaracterized the evidence to the jury. The Council believes that Ms. Morask’s history demonstrates that she cannot be impartial as a judge and we change our finding to Not Qualified. Non-lawyers may be surprised to learn that lawyers seeking judicial office are expected to disclose instances where they've been criticized by a court -- to tell on themselves -- but that does not explain how the Council would have had access to unpublished orders critical of Ms. Morask, assuming that Ms. Morask refused to cooperate with the Council, as the Council report states. Loza and Morask were both rated "qualified" by the Northwest Suburban Bar Association for the February primary. Both Morask and Loza have posted statements about their candidacies on Cook County Clerk David Orr's website. Here is Loza's statement; this is a link to Morask's statement. Ms. Morask was one of several primary candidates who submitted a statement to this blog in her own words. Ms. Loza's campaign website is www.lozaforjudge.com. Ms. Morask's website is electlaura.net. Should Cook County retention judges be nervous about "no" votes? Although the judges up for retention this year, and their friends and families, are surely paying close attention, there are not a lot of experts who can give advice or counsel about their situation. The judges have nothing to worry about. In fact, because of the almost certain high Chicago turnout of Obama supporters, I believe that approval rates may well break the all-time Cook County record of 80.5% (median, 1972). Casual voters, and minorities, are relatively more likely to cast all-yes votes on retention slates. In addition, the elimination of straight-party voting and the shift away from punch cards have also given indirect boosts to approval rates. I would be VERY surprised if any judge is seriously threatened in this election. These are points that Dr. Klumpp made in an October 2006 Illinois Bar Journal article, "Voter Information and Judicial Retention Elections in Illinois," 94 Ill.B.J. 538 (membership required). A footnote to that article informs us that Dr. Klumpp wrote "the first doctoral dissertation ever... on judicial retention elections." We have a fun tradition when voting for judges in Cook County. We run down the list of judges and vote "no" for each and every one of them. * * * Every "no" vote means the judge has to garner something along the lines of 3 additional "yes" votes, so if every SCC reader voted "no," we might be able to effect some tiny change by throwing sand in the gears of the Machine. As of this evening, according to Sitemeter, SCC averages 8,576 readers per day. It may well be that SCC is a long-standing member of that group of 10-15% of voters who vote "no" on every retention judge at every election. Certainly some of the people who left comments on that SCC post are regular "no" voters. Still, persons wishing to support the retention bids of qualified judges should remember to express that support at the polls. The Alliance of Bar Associations for Judicial Screening is comprised of the Asian American Bar Association, Black Women Lawyers’ Association of Greater Chicago, Chicago Council of Lawyers, Cook County Bar Association, Decalogue Society of Lawyers, Hellenic Bar Association, Illinois State Bar Association, Lesbian and Gay Bar Association of Chicago, Puerto Rican Bar Association of Illinois, and Women’s Bar Association of Illinois working collaboratively to improve the process of screening judicial candidates in Cook County, Illinois. In an October 15 editorial the Chicago Tribune advised voters to reject the retention bids of four Cook County jurists, Evelyn Clay, Vanessa Hopkins, Edward Pietrucha, and Casandra Lewis. 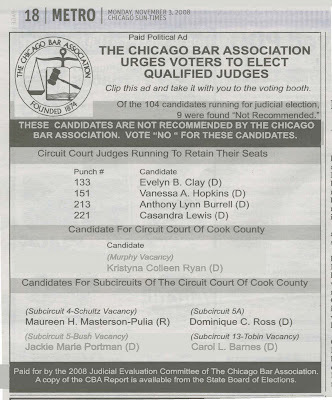 The Tribune encouraged 'yes' votes for all the other Cook County Judicial candidates. Of the four candidates rejected by the Tribune, both the Chicago Bar Association and the Chicago Council of Lawyers agreed that Judges Clay, Hopkins and Lewis do not merit retention. More information about these judges, including the CBA and CCL comments about them, can be found at this post. Judge Edward N. Pietrucha's page on the Cook County Retention Judges Website can be accessed by clicking here. Hon. Edward N. Pietrucha was elected to the bench in 1996. He began his judicial career with an assignment to the First Municipal District. Since 1998, he has sat in the Juvenile Justice Division, where he has been a floating judge since January 2002. Judge Pietrucha is considered to be a smart and hard working judge. However, during his evaluation, many judges, defense counsel, prosecutors, and probation officers expressed outrage at the temperament displayed by Judge Pietrucha. He is reported to exhibit bullying behavior toward lawyers, children, and their parents and guardians. Some lawyers commented that he can be inconsistent in his rulings. 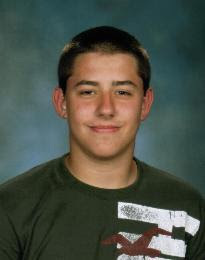 Others commented that he inappropriately does not take into account the recommendations of probation officers – an important part of the juvenile justice system. The Council finds him Not Qualified for retention. Judge Edward N. Pietrucha is "Qualified" for retention as a Circuit Court Judge. Judge Pietrucha was admitted to practice law in Illinois in 1989 and was elected to the Circuit Court in 1996. Judge Pietrucha is currently assigned to the Juvenile Justice & Child Protection Department of the Circuit Court. While Judge Pietrucha knows the law, serious concerns were raised about his temperament, which reflects a disregard and disrespect for the litigants and lawyers who appear before him. The battle has moved into the Appellate Court, and may soon be moving directly to the Illinois Supreme Court, according to this update from Steve Merican. According to the above linked post, on Merican's Illinois Appellate Lawyer blog, Merican has been retained by the individual plaintiffs in the ballot suit to file a motion to bypass the Appellate Court and proceed immediately to the Illinois Supreme Court. Triggering the decision, according to Merican's blog, was an order from the First Appellate District on the plaintiff-appellants' motion for an expedited briefing schedule. The order, entered October 8, gave the government agency defendants until October 14 to respond to the motion and set hearing on the motion for October 15. Only then would the Appellate Court decide whether to expedite the case. This is a whirlwind timetable in almost any case -- but, as persons following this case already know, state and local election officials were protesting to the trial court, before the end of September, that it was already too late to correct the ballot. At some point, and presumably at some point soon, even if that claim was once exaggerated, it must certainly become true. And yet, as Judge Howse ruled on October 1 that language framing the question for Illinois voters was "downright misleading" and unconstitutional. The Illinois Supreme Court has named Cook County Public Administrator Michael Ian Bender to a 9th Subcircuit vacancy created by the resignation of Judge William Patrick O'Malley. The appointment, effective November 8, will terminate on December 6, 2010. In addition to his service as Cook County Public Administrator, Bender is a member of the firm of Nadler, Pritikin, and Mirabelli, LLC. According to the Chicago Daily Law Bulletin article noting the appointment, Bender was a previously a partner in the firm of Bender & Bender, from 1993 to 2004. He has served as a prosecutor for the Village of Skokie and was President of the Skokie Park Board of Commissioners from 2001 to 2005. The Nadler, Pritikin and Mirabelli website notes that Bender is a past president of the Decalogue Society of Lawyers, that he has served "as a Board Member for the North Shore Center for the Performed Arts and is currently an Executive Board Member of the Holocaust Memorial Foundation of Illinois." In a post earlier today I mentioned that the Chicago Bar Association singled out four judges (out of 68 Circuit judges evaluated in all) as "not qualified" for retention: Anthony Lynn Burrell, Evelyn B. Clay, Vanessa A. Hopkins, and Casandra Lewis. 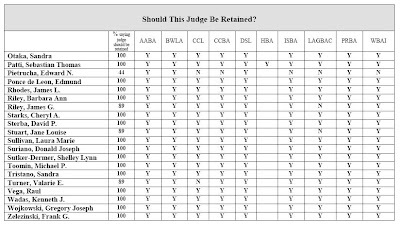 Voters trying to decide if they will vote according to the CBA's assessment may also want to look at the ratings these judges received from the Alliance of Bar Association ratings. 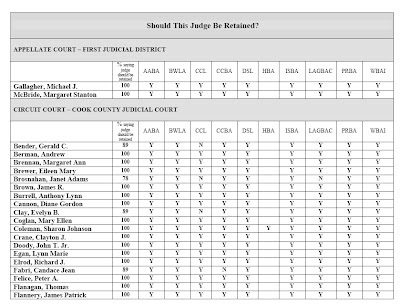 Also, voters can look at what has been posted on behalf of these judges on the Cook County Retention Judges website. Judge Anthony Burrell is “Not Recommended” for retention as a Circuit Court Judge. Judge Burrell was admitted to practice law in Illinois in 1989 and elected to the Circuit Court in 2002. Judge Anthony Burrell has problems with punctuality and absences. In addition, Judge Burrell is poorly organized which affects his ability to run a high volume courtroom. Hon. Anthony Burrell was elected to the bench in 2002 and currently sits in the First Municipal District, hearing civil non-jury trial cases. He has in the past presided over forcible entry and detainer cases. Before his election to the bunch, he worked with the Chicago Public Schools as a consultant, as a solo practitioner, and as an Assistant Cook County State's Attorney. Judge Burrell is reported to be doing well in his current high volume court call. He is considered to have good legal knowledge and temperament. The Council finds him Qualified for retention. Judge Evelyn B. Clay is "Not Recommended" for retention as a Circuit Court Judge. Judge Clay was admitted to practice law in Illinois in 1981 and was elected a Circuit Court Judge in 1996. Judge Clay is currently assigned to a felony courtroom in the Criminal Division. Concerns were raised about Judge Clay’s knowledge of the law and poor judgment in making insensitive comments from the bench. Hon. Evelyn B. Clay was initially assigned to the First Municipal District after her election to the Circuit Court in 1996. In 1997, she was transferred to the Felony Trial Division, where she sat in the Evening Narcotics Section and as a floating judge. She has been in her present assignment, hearing felony trials, since April 2000. However, Judge Clay's retention bid has been endorsed by every other member of the Alliance of Bar Associations. Judge Vanessa A. Hopkins is "Not Recommended" for retention as a Circuit Court Judge. Judge Hopkins was admitted to practice law in Illinois in 1994 and was elected to the Circuit Court in 1996. Judge Hopkins’ lack of legal experience and legal knowledge is a concern. Judge Hopkins is extremely slow and prone to giving very long continuances for a call that should move more quickly. There is a general report by lawyers who appear before her that she has a temperament problem and takes challenges or questions personally. Judge Hopkins also has problems with being on time and seems unable to figure out what she needs to do to efficiently and effectively manage her court call. Hon. Vanessa A. Hopkins was first assigned to the Traffic Division following her election in 1996. She has been assigned to Juvenile and Municipal Districts, and presently hears jury cases in the First Municipal District. Judge Hopkins came to the bench with just two years of legal experience. In her 2002 evaluation, the Council questioned her ability to manage her call. In her 2008 investigation, while some lawyers say she has improved, there are continuing negative reports about her courtroom management. Lawyers complain that she too often loses control over her courtroom, has an imperfect temperament, and is sometimes not punctual. The Council finds Judge Hopkins Not Qualified for retention. On the other hand, except for the Lesbian and Gay Bar Association of Chicago, all the other Alliance members have recommended Judge Hopkins for retention. Judge Casandra Lewis is "Not Recommended" for retention as a Circuit Court Judge. Judge Lewis was admitted to practice law in Illinois in 1991 and was elected to the Circuit Court in 2002. Judge Lewis has problems in a number of areas including starting her call on time and diligently carrying out her duties on the bench. Judge Lewis needs to improve her work ethic and was less than respectful of the bar associations’ peer review process. Hon. Cassandra Lewis was elected to the bench in 2002. She currently hears jury and bench trials in the First Municipal District. Prior to becoming a judge, she spent nine years in private practice and two years as an Assistant Kane County State's Attorney. Judge Lewis has adequate legal ability for her current assignment and is praised for her temperament. She receives mixed reviews, however, for her work ethic -- many lawyers complain she is not well-prepared and is often not punctual in taking the bench. The Council has received reports that some lawyers will take a substitution of judge rather than appear before her. The Council finds her Not Qualified for retention. Many of the Alliance members agreed with these evaluations: The Decalogue Society of Lawyers, the Illinois State Bar Association, the Lesbian and Gay Bar Association of Chicago, the Puerto Rican Bar Association of Illinois, and the Women’s Bar Association of Illinois all declined to endorse Judge Lewis' retention bid. On the other hand, the Asian American Bar Association, the Black Women Lawyers’ Association of Greater Chicago, and the Cook County Bar Association have recommended Judge Lewis for retention. The Alliance of Bar Associations has nearly completed its evaluation of all 70 Circuit and Appellate judges seeking retention in Cook County on November 4. Only the Hellenic Bar Association has yet to finish weighing in on the retention judges; when I receive that organization's evaluations, I will post it as well. The ISBA's Joyce Williams, who organizes the process of collating and distributing all this information for the Alliance, said in an email, "Since we are sensitive to the fact that many voters would prefer a composite rating, we included a percentage column of favorable ratings from those Alliance members who have submitted ratings." In looking at the grids that follow (and, please, click to enlarge each grid in order to read it more easily), the percentage of favorable ratings is the number in the first left column after the judge's name. There are two initial things that should be kept in mind while evaluating these grids. First, an impressive majority of judges seeking retention was recommended for retention by each of the Alliance bar associations. Second, while some bar associations differed with each other (and with the Chicago Bar Association) over the merits of particular retention candidates, every single judge up for retention this year was found qualified by one or more of the bar associations that investigated the judges' credentials. This list is in alphabetical order. The ballot order will be different. Ms. Williams mentioned that, "The Chicago Council of Lawyers/Appleseed For Justice has their 'voteforjudges.org' website up and running." That site, she said, "does show ballot order with 'yes' and 'no' punch numbers to answer the 'should this judge be retained' question." 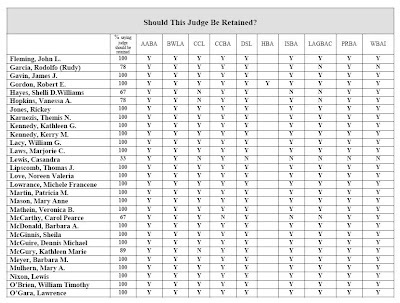 The Chicago Bar Association has published its ratings for Cook County retention candidates on the November 4, 2008 ballot. That link will take you to the entire 38 page report. In summary, both Appellate Court justices seeking retention, Michael J. Gallagher and Margaret Stanton McBride, have been rated qualified by the CBA, as have all but four of the 68 Circuit Court judges seeking retention. The four judges singled out by the CBA as "not qualified" for retention are Anthony Lynn Burrell, Evelyn B. Clay, Vanessa A. Hopkins, and Casandra Lewis. The linked report also contains the CBA's ratings for all other candidates running for judge this November, including those who are running in contested races. I'll post more about the CBA ratings soon. I received a "friend to friend" card the other day, this one encouraging me to support the retention efforts of Judge Lewis Michael Nixon, pictured at right. A lot of voters will receive postcards touting one judge or another from parents of their kids' high school classmates, church members, or from persons with whom they only otherwise correspond at the Holidays. The theory is that a voter receiving such a card will think, "Jane Smith says Judge Jones is a good egg, so I'll remember to vote for her on Election Day." I don't know if the effectiveness of these cards has or even could be established. But I do know that this particular card, supporting Judge Nixon, was unusual because it didn't come in the regular post; it was delivered by email. In fact, the picture I've used here of Judge Nixon was clipped from that email. The poor job of editing out the background is, alas, mine. I called the lawyer (a colleague of long-standing) who sent me the email (e-card?) to ask where he got the idea and whether he thought that e-cards might quickly become the norm for this sort of campaigning. My colleague decided he would rather not be quoted, so I'll have to venture my own prediction: This will catch on. A postcard can only convey a limited amount of information. The e-card received on behalf of Judge Nixon conveyed that same sort of information in the text of the email itself, including the personalized endorsement, but (thanks to the miracle of attached files) there was a also a two page flyer in the ubiquitous Adobe format containing an expanded biography of the judge and a plug for the campaign on behalf of and a cite to the website supporting all the Cook County retention judges. The busy voter can easily explore the claims made on behalf of the candidate by his or her emailing friend -- and the candidate is spared the expense of postage. Yes, this will most certainly catch on. Twelfth Subcircuit Republican Circuit Court candidate Laura Morask's campaign advises that Ms. Morask has been endorsed by the Fraternal Order of Police, Chicago Lodge No. 7. I will confess to 'sitting' on this announcement for awhile because I was hoping to hear back from the FOP regarding any endorsements it may have made in other judicial races. When and if I do, I will be pleased to post them here. Judge Howse's decision came at the end of a four hour hearing at the Daley Center on suits brought by the Chicago Bar Association and individuals Robert Costello, et al. The court directed the parties to discuss and, if possible, reach agreement before the next hearing on the wording of a curative notice that could be handed to voters when they enter the polling place. Judge Howse has set that next hearing for Friday morning at 9:00 a.m.
Today's hearing was conducted in Judge Alfred Paul's larger courtroom in order to handle the overflow crowd. In addition to the many attorneys, and some of the individual plaintiffs in case no. 08 CO EL 11, there were a number of reporters and several worried employees of the Chicago Board of Elections and the Cook County Clerk's office. Clerk David Orr arrived in person late in the afternoon. Counsel for the Chicago Board of Elections, James M. Scanlon; Orr's attorney, Assistant State's Attorney Donna M. Lach; and Assistant Attorney General Thomas A. Ioppolo, on behalf of the State Board of Elections and Illinois Secretary of State Jesse White, tried to explain to the court why the election officials were nervous. "Voting technology," Scanlon told the court, "has outstripped the law." With the old punch card system, a last minute change in the ballot could be accommodated by taping over lines in the ballot booklet, or pasting a new page on top of an old one, but these techniques would not work with optical scan ballots, the voting method used by over 80% of Cook County voters. Election laws, which allow for last minute changes, have not been revised to accommodate these new realities. Lead CBA counsel Steve Pflaum charged that the election authorities were simply "digging in their heels" and "saying no, no, no," to all proposed corrective measures. He tried to strike a conciliatory note: It was understandable, he said, that the election officials "are reluctant to clean up a mess" made by others. The CBA doesn't see itself as being adverse to the election authorities; it wants to work with them to provide a fair election that won't be subject to challenge because of unconstitutional ballot language. "We can salvage this election," Pflaum told the court. But Tom Ioppolo warned that challenges to the election would probably arise from whichever side loses the November election. In the meantime, he insisted, there are "no good alternatives" to moving forward with the ballot as already designed. But the Con Con ballot was designed in stages. 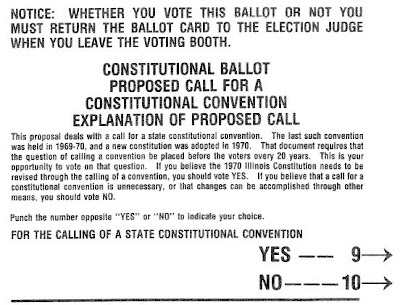 The language of HJR 137, adopted by the Secretary of State, did not contain the "notice" language that incorrectly tells voters that a failure to vote on the Con Con proposition is equivalent to a "no" vote. 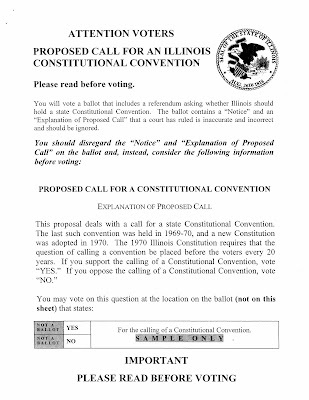 Bruno Behrend, counsel for the Costello Plaintiffs and a co-founder of the Illinois Citizens Coalition, stressed how the "notice" language was added on by the State Board of Elections -- and how his group was told that this language would not be included for a couple of weeks after it actually was added. Pflaum noted that the State and the election authorities focused their arguments today on the remedy that should be given for the constitutional violations. However, Pflaum argued, altogether too much emphasis was placed on why ballots could not be reprinted at this late date and not nearly enough on other possible corrective measures. Scanlon did lay out for the court an elaborate explanation as to what would be involved in reprinting the ballots, from the problems in getting the right kind of paper for the sensitive scanners, to the time necessary to test the new ballot with each individual scanner before they could be delivered to the polling places. And Scanlon cautioned the court that a solution that might work for Chicago or Cook County might not work for election officials elsewhere in the State: Many different vote counting systems are in use. Lt. Gov. Pat Quinn, who intervened on the Plaintiffs' side, forcefully advocated the use of a separate paper ballot. Paper ballots, he noted, were used in the 1968 vote that resulted in the call for the 1970 Constitutional Convention. Paper was used for the ballots by which the new Constitution was ratified. But Donna Lach worried that there would be a huge burden placed on polling place officials in issuing and keeping track of a separate paper ballot. Also, she noted, forcing a second, separate Con Con ballot on voters might force people to vote on the proposition who did not want to or else disclose their intention to bypass the proposition to all others present. The scan card and the paper ballot would not be deposited in the same box so it would be obvious if the paper ballot were not returned. In ruling that the 75-25 language in the "explanation" was improper and in finding the "notice" language "downright misleading," Judge Howse expressly rejected the laches arguments raised by the named Defendants and the Cook County Clerk. However, Judge Howse also rejected the CBA's argument that the participation of the legislature and the State Board of Elections in getting the Con Con call on the ballot was itself improper. True, he said, the Constitution did say that the Secretary of State was the proper authority to certify this question to the ballot -- but the Constitution did not say how this must be done or lay out every step. The Secretary of State was set up as an authority of last resort in case the legislature failed to put the question to the voters on its own. Will a separate explanatory notice, trying to correct the misleading statements supplied by both the General Assembly and the State Board of Elections, really make this election fair? Or will it only compound voter confusion? The Iowa Court of Appeals today reversed the assault causing serious injury conviction against Chicago Police Officer Mike Mette. Here is a link to the court opinion. What the defendant failed to do however, was to retreat from the situation to avoid any problems. All any of the six had to do was get in the car, go inside the house, or walk away and call the police about the disturbance. After being pushed and knocked backwards two or three times, there was nothing in the record to indicate Michael could have avoided Gothard’s next blow, without his defensive punch. While it may be possible to speculate on Michael’s ability to retreat, the record is utterly void of any testimony to support that assumption.